The Taking Of Annie Thorne (published in the US under the title The Hiding Place) is CJ Tudor's second novel. Her horror-tinged psychological thriller The Chalk Man was one of my favourite reads of 2018 and was widely praised, even carrying an endorsement from Stephen King who saw in it echoes of his own work. The Taking Of Annie Thorne is really more horror than thriller. Joe Thorne, a teacher with a shady past, returns to the Nottinghamshire mining village in which he grew up to take a job at his former secondary school. He's short of money - for reasons later revealed - and decides to rent a cottage that nobody else will touch, primarily because it's the site of a recent, horrifically gruesome murder-suicide carried out by the very teacher whose old job he's filling. Arnhill, like so many villages all but destroyed by pit closures under the Thatcher government, is a miserable place with a general air of insularity and neglect, and when Joe was growing up there, also the scene of an appalling family tragedy involving the disappearance of his little sister, an unsolved mystery which tore the Thorne family apart. Which raises the obvious question: if Arnhill holds nothing but bad memories, why has Joe decided to to go back there? 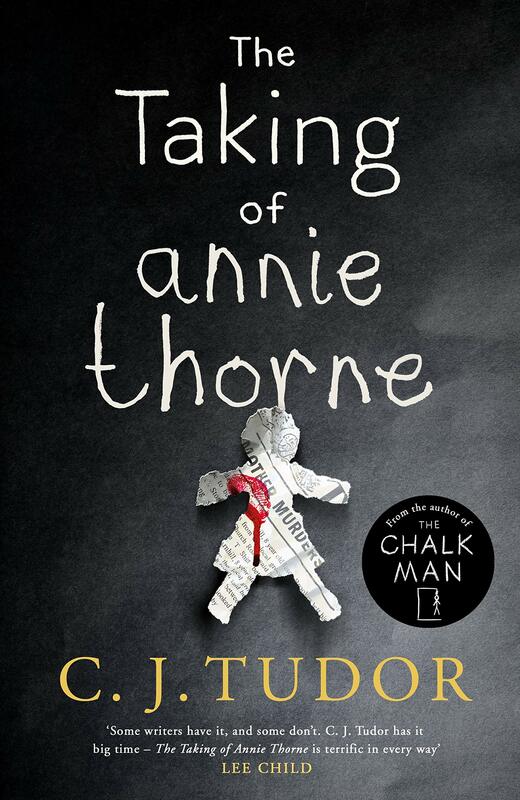 What unfolds is a dark horror story with several twists, but in contrast to The Chalk Man, The Taking Of Annie Thorne feels like a fairly formulaic tale. If you saw scenes and characters inspired by Stephen King's work in The Chalk Man, you'll see a major plot element in The Taking Of Annie Thorne which is all but identical to the entire premise of one of King's best-known novels. I won't say which one, because if you've read it this would be a serious spoiler, but I will say that what felt more like homage in The Chalk Man feels as if it's edging into fanfiction in The Taking Of Annie Thorne. There were so many other things that Tudor could have had happen to Annie during her disappearance than the explanation that's given, and the book would have been more effective too. A lot of the dialogue is contrived, with too much self-conscious wisecracking and clumsily-executed sarcasm that's never actually particularly witty. I also just couldn't engage with the crime-related subplot of this book, in which Joe is entangled with a sinister gangland figure to whom he owes a substantial amount of money. I don't think it's particularly well-executed and it jars with the rest of the book. While I didn't find Joe Thorne remotely likeable, I didn't need to in order to care about what happened to him. He's a selectively unreliable narrator, of course, and his choices are consistently poor both in childhood and as an adult, but I found him interesting - in particularly, his relationship with his little sister is somewhat ambiguous in its intensity. The horror elements of the novel are, while more derivative than I'd have liked, also very effective - and the multiple twists towards the end of the book were not something I saw coming. The Chalk Man is a much more accomplished and subtle work, so much so that it makes me wonder if The Taking of Annie Thorne was actually written first: overall, I was disappointed. All that said, I'll certainly look out for CJ Tudor's third novel and I'm sure she'll make a return to form.